With a grand total of 68 signees, the Arizona Track & Field Class of 2018 was one of the biggest and most accomplished classes in state history. With the conclusion of the NCAA Indoor Track season this past weekend, we took a look at notable performances and accomplishments from Arizona's Class of 2018 competing in their first track season at the collegiate level. Sprinters: On the Sprinter side, several Arizona athletes made their mark in the NCAA. 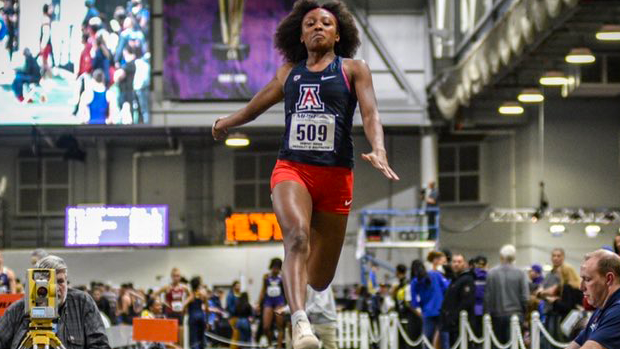 In our home state of Arizona, Tanner Hagstrom, James Smith Jr., and Neysia Howard all had phenomenal indoor seasons at the University of Arizona. Hagstrom posted a PR in the 800m with a time of 1:53.98, while also performing an impressive time in the 600m with a time of 1:20.69. Smith, the country's 4th fastest high school 300m Hurdler in 2018, ran PRs in the 400m (48.08) as well as the 600m (1:18.36). Neysia Howard, the 2018 D1 state champion in the 100m and 200m, set PRs in the 200m (24.16) and the Long Jump (5.90m). She also placed 3rd in the 200m at her conference championship. Sprinting for the University of Miami, Tyrees Moulton clocked in a 47.93 400m and a 34.23 300m. He was also on Miami's 4x400m team that took 2nd at the ACC Championship. In the Midwest, Morgan Parzych and Stacey Boyd competed for the University of Wisconsin in the Big 10. Parzych, the 2017 and 2018 D1 400m State Champion, PRed in the 600m with a time of 1:33.01, while also being the only freshman on the women's 4x400 team that broke the school record at the Power Five Invitational. Boyd was just .04 off his PR in the 200m with a time of 21.64, and he made his debut in the 60m dash with a time of 6.89. His most impressive accomplishment in his first collegiate season however came in the DMR. Boyd ran the 400m split for the Badgers at the Alex Wilson Invitational, when they clocked in at 9:26 for the 3rd fastest time in NCAA history. Distance: The distance side dominated the Arizona class of 2018, with more than half of the signees being distance runners. Northern Arizona superfrosh Jesselyn Bries PRed in the Mile at the Iowa State Classic with a time of 4:51.01. She also finished 7th at the Big Sky Championship in the cross-country season, finishing 1st for the Lumberjacks. At Grand Canyon University in the heart of Phoenix, Jacob Lewis, Reier Gilbertson, Anthony Haren, and Bryce Schmisseur were a part of the Men's Track team that won the Western Athletic Conference Championship. Lewis ran the 800m leg on the Men's DMR that took 2nd at the WAC Championship. At 7000 feet elevation, Gilbertson PRed in the 800m with a time of 1:57.70. Although he ran respectable times in the Indoor season, Haren's most notable accomplishment of his freshman year so far came in the fall Cross Country season, when he broke the 25-minute barrier in the 8K with a time of 24:50. At Central Arizona College in Casa Grande, Desert Vista alum Habtamu Cheney PR'ed in the 5000m with a time of 15:06 at the National Junior College Championship, finishing in 9th place. Cheney's former Thunder teammates, Reece Donihi and Aksel Laudon, competed for the University of New Mexico and Boston University. Although he redshirted his indoor track season at New Mexico, Donihi ran stellar times in the fall with an 8K time of 24:54 and 10K time of 30:41. Donihi also represented the United States in Trinidad this February as a member of Team USATF in the NACAC Cross Country Championship. In the Patriot League, Laudon PRed in the Mile with a time of 4:16.56. Joining him in the Patriot League was Hamilton alum David Nelsen, who competed for the US Naval Academy in Annapolis, Maryland. Nelsen ran PRs in the Mile (4:23.89) and 800m (1:54.07). 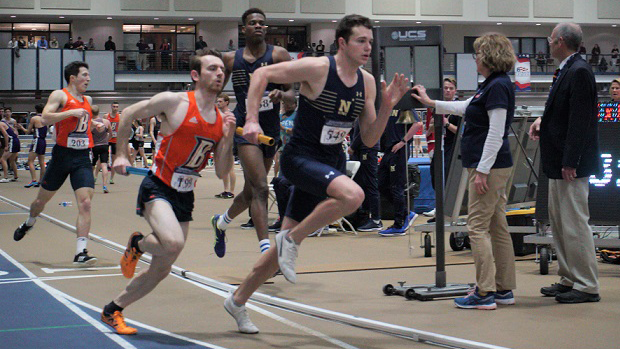 He also ran the 3rd leg on the Navy's 4x800m Relay team at the Patriot League Conference Championship, splitting a 1:52.3 and winning the event with a team time of 7:29.98. In the Southeast region of the country, Caden Hercules competed for Middle Tennessee State, where he ran 25:59 in the 8K during the fall and 15:30 in the Indoor season for the 5000m. Nearby at the University of Central Arkansas, the 2017 and 2018 3200m D1 State Champion Thomas Cain was a member of the Men's cross-country team in the fall that won the Southland Conference Championship. In the Indoor season, Cain ran a 15:15 5000m time at his conference meet. 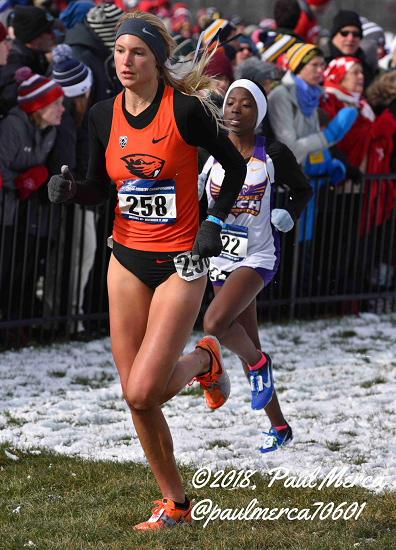 On the opposite side of the country in the Pacific Northwest, the 2017 D1 Cross-Country State Champion, Haley Wolf competed for Oregon State University. In the Indoor season, Wolf PRed in the 3000m with a time of 9:39.47, while running an impressive Mile time of 4:55.68. In the fall, Wolf helped lead the Beavers to their first ever school appearance in the cross-country NCAA National Championship, where she finished 2nd on her team and 15th in the nation among freshman with a 6K time of 21:18. Hurdlers: In Arizona, Malik Chandler competed for Ottawa University, where he was on the 4x400 team that finished 5th in the nation in the NCCAA. Former 300H D3 state champion Darzell Smith competed for Arizona Christian University, where he ran the 60H (8.94), 110H (16.15), and the 400H (1:03.19). Johnie Talamantes, who medaled in 4 events at the D1 State Meet last May, ran 8.27 for 60H, while jumping 6.71m in the Long Jump and 13.26m in the Triple Jump for Weber State. Jae'nisa Heckstall, former D2 State Champion in the 100m Hurdles and 300m Hurdles, ran 8.54 in the 60m Hurdles while also running a PR of 24.63 in the 200-meter dash. Ultimately, she concluded her freshman indoor season for Purdue when she finished 18th in the 60-meter Hurdles at the Big-10 Conference Championships. Jumps: Jake Hall, the former D3 High Jump State Champion from Snowflake High School, jumped 2.00m in the high jump at the Air Force Academy. His Snowflake Lobo teammate, Dylan Kay, signed with Brigham Young University, where he redshirted his indoor season. Chandler High alumnus and former state medalist Diamond Black jumped 11.47m in the Triple Jump, 5.30m in the Long Jump, and ran a 60m time of 8.19 for the University of New Mexico. Former D3 Pole Vault State Champion Andrew Ference pole vaulted at the University of Tennessee. Ference cleared a lifetime best height of 5.15m, just shy of 17 feet. Jai Gruenwald, the 2018 AZ Gatorade Athlete of the Year and 10x State Champion, redshirted her indoor season at UCLA. Throws: At Grand Canyon University, Desert Vista alum and 2x State Champion Deshon Toney threw 14.50m in the Shot Put and 13.94m in the Weight Throw. To the north, at Colorado School of Mines, former Arizona D3 Discus State Champion Arvid Veidmark threw 15.66m in the Shot Put, and made his debut in the Weight Throw with a mark of 15.68m. Taylar Kregness, a 4x D3 State Champion from Show Low High School, threw 11.88m in the Shot Put and 13.65m in the Weight Throw for the University of Texas-Rio Grande Valley. Finally, Tyson Jones, the Arizona State Record Holder in the Shot Put, threw the 16 lb. shot with a mark of 17.69m for Virginia Tech. Back in 2018, Jones was had the #1 high school mark in the country with a throw of over 70 feet. This season, he placed 5th at the ACC Championships to earn 2nd-Team All-Conference Honors. Congratulations on a great indoor season, and good luck this spring!